Creates 30% more storage space. Works in very narrow aisle, just need 1780mm(depending on pallet size). Lifts to height of 11 metres. Loads like a counterbalance forklift truck. 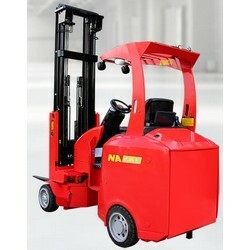 Lift load of up to 2000kg capacity. Easy operation inside and out. Turning 180 degree both side of aisle.